Winter pressures on the NHS is a frequent headline story and huge problem. There is a massive bed shortage nationally: last year bed occupancy often exceeded 95% over the winter months. There is an increased risk of infections, flu, and the impact of extreme and cold weather. Elderly patients and those with long-term conditions are most likely to be affected by these and are also more likely to frequently access GP services. The RCGP has just released a new mantra: “3 before GP”. This is suggested as a pragmatic way to decrease winter pressures. Patients are urged to try these three steps, before booking an appointment at their GP surgery. Seek advice/ treatment from pharmacists. It quickly allows patients to consider alternative sources of help. It is marketed as a tool to help empower patients, and reduce strain at this busy time of year. There is a severe shortage of GPs and appointments are difficult to come by quickly. If just 5% of patients were able to avoid seeing their GP, using this strategy, then more than 50,000 appointments would be freed up. Unfortunately, the Telegraph has already described this as “Ask ‘Dr Google’ before your GP”. This portrayal in the media brings with it all the negative connotations of searching for your symptoms online. This contradicts the benefits that this strategy, if well-advertised, could have on resources and to patients. 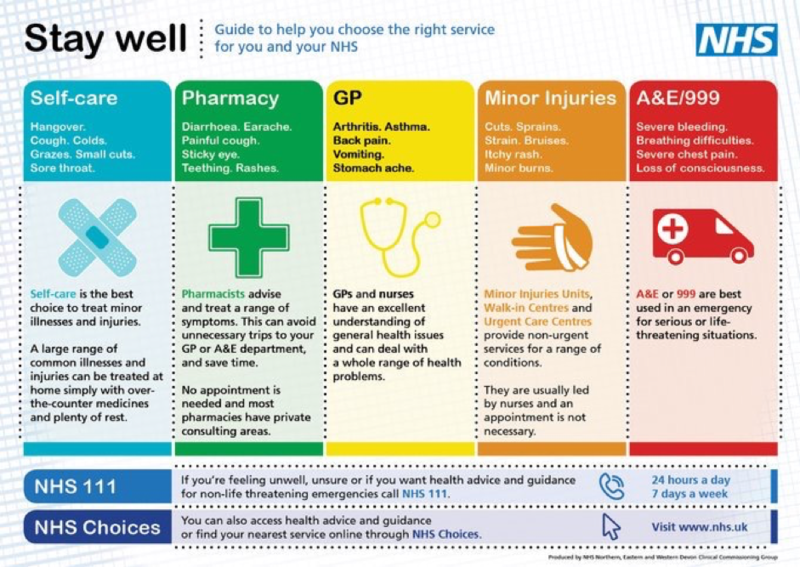 In principle it is a good idea for people to consider these steps, and if used effectively, this could prevent the inconvenience to patients of seeing their GP while reducing the strain on GP services. Patients are increasingly frequently turning up to see their doctor with questions and ideas from their own research online. It is encouraging to see patients being more proactive and taking more responsibility for their health. Reputable web sources include: NHS Choices, patient.co.uk. NHS inform, Change 4 life, the Self Care Forum and the Department of Health. However, caution is advised when searching for symptoms. It is important to access resources such as above, which provide comprehensible and consistent information. A study published in the British Medical Journal, looked at 23 websites from around the world and found that the correct diagnosis was only identified correctly first time 34% of the time. Triage advice fared better than diagnosis, with accurate suggestions 57% of the time. There are huge amounts of confusing, conflicting and complex information available, causing anxiety and the introduction of the cyberchondriac. A word of warning should also be issued with regards to US based sites, which are more likely to be influenced by drug companies and their advertisements, which may skew information. Using this information well allows education of society and helps patients. Let’s hope for more of this positive use of resources, and hope that it is has the desired effects. This will require clear direction towards appropriate webpages, to avoid the aforementioned potential pitfalls. The Royal College of Pharmacists has endorsed this strategy. Pharmacists are experts on medicines and can offer advice on common winter ailments, side effects of prescription medicines and when symptoms require further help. They are a brilliant source of knowledge, advice, and support to complement other services. ← Pill identifiers – where to look and what are the common pills you might want to identify?